Tastes just like real candies! 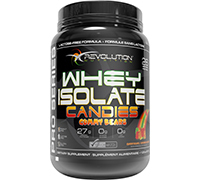 Whey Isolate Candies™ uses the exclusive Revolution Nutrition™ flavoring system that makes a protein shake taste just like your favorite CANDIES! Whey Isolate Candies™ mixes perfectly and does not have a milky texture. This fat-free formula provides 27 grams of high-quality protein per serving and is both lactose and gluten free! Whey Isolate Candies™ supplies your body with 27 grams of protein of the highest biological value possible, allowing your body to easily absorb all the benefits of protein! Lactose intolerance affects a great number of individuals. Whey Isolate Candies™ has been carefully engineered to supply lactose intolerant individuals with a protein supplement that is right for them! Protein need depends greatly on your body type, gender, weight and the level of activity you maintain. Mix 1 scoop of Whey Isolate Candies™ with 200-250 ml of cold water. Whey Isolate Candies™ is a dietary supplement, do not use as a unique source of food.